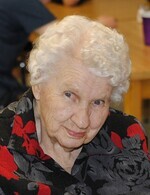 Ellen was born in Watrous on Oct. 9, 1924 the youngest child of John and Maggie Wilson. Ellen’s mom passed away when Ellen was only 12 years old so big sister, Lizzie, and older brothers, Jim and Bob helped their dad raise their young sister. The Wilson’s had emigrated from Scotland so they were alone in Canada without any other relatives. On June 15, 1943 things changed as Ellen married Alex Farago and they spent the next 63 years together. Marrying into the Farago clan gave Ellen the extended family she never had. Ellen always enjoyed the farm life and the closeness of family and friends. The many Christmas Eve get togethers and card playing were always fondly remembered. In 1978, Ellen and Alex moved to Watrous. They loved retired life and became very active in the Senior Centre. Ellen enjoyed bowling, Danceland dances, senior winter games, weekly card tournaments and card playing. Ellen developed many very close friendships, which lasted the rest of her life. Moving to Jubilee Court after Alex passed was the best thing for Ellen. Many of her friends lived there also so there was never time to be lonely. Family was always very important to Ellen. Every year on Thanksgiving weekend all of Ellen’s family would come for dinner to celebrate Ellen’s birthday. Ellen was always so excited and proud. It was the highlight for her to show off her family especially the grandchildren and great grandchildren. Ellen is survived by her children: Don Farago, Joan (Robert) Callaghan, Gail (Bob) Lawson, Wes (Myrna) Farago; grandchildren: Darryl (Darlene) Callaghan, Derek (Carla) Farago, Pat (Colleen) Callaghan, Clarice Brotzel, Tasha (Mike) Wurm, Cole (Shantal) Lawson; Great Grandchildren: Adam and Mason Brotzel, Ethan and Evan Callaghan, Callie and Chase Callaghan, Alex and Beckett Wurm, Birkley Lawson; sisters-in-law Deloris (Ken) Sutherland, Julia Galvin and many nephews, nieces and other relatives. Ellen is predeceased by her husband, Alex Farago, daughter-in-law Shirley Farago, great-grandson Nixon Lawson, mother Maggie, father John, sister Lizzie Balogh, brothers Bob Wilson and Jim Wilson, in laws Joe Farago, Steve (Margaret) Farago, John (Mary) Farago, Mary (Mike) Sollosy, and Ambrose Balogh. The family would like to thank the Manitou Lodge for their compassion and caring during the last few days of Ellen’s life.